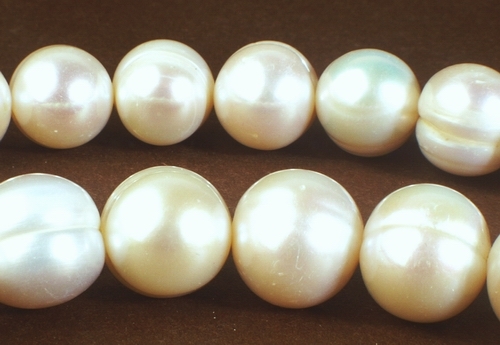 Price is per 15-inch strand of these massive lustrous pearls. Totally white (unlike picture). Largest is a big 12.5mm - about 34 to the strand. As picture - just a little grooving to show natural. Most pearls these days are cultured. These natural freshwater pearls occur in mussels for the same reason saltwater pearls occur in oysters. Foreign material inside a mussel can't be expelled. To reduce irritation, the mollusk coats the intruder with the same secretion it uses for shell-building, nacre. To cultivate a pearl, farmers slit the mussel and insert small pieces of live tissue from another mussel. Cultured pearls are now created in all shapes, sizes, and colors: white, silvery-white, pink, red, copper, brown, lavender, purple, green, blue, and yellow. The most desirable are the pastel pinks, roses and lavenders. Natural color comes from the mussel species and water quality ¨C with pearls taking the color of the shell in which they form. However, permanent dyes are used today for most saturated colors. Good pearls have thick overlapping layers of nacre. This can be tested by viewing its luster. Roll the pearl with a pen in good light - the best pearls will reflect the pen the most. A large pearl is only more valuable if it's the same quality as a smaller one - and the rounder the better. Being an organic gem, grooves, pits, or dents are usual.